Extended from Romford to Harold Hill replacing withdrawn 86B. Hornchurch (RD) allocation added. Saturday converted to RTL operation. Daily Hornchurch (RD) allocation withdrawn. Barking (BK) Mon-Fri and Sunday allocation withdrawn. North Street (NS) allocation introduced. North Street (NS) converted to RT operation. Mon-Fri peak journeys extended in Dagenham to Fords Foundry. Daily journeys introduced to Fords Foundry. Barking allocation converted to RT. North Street (NS) converted to RM operation. Barking (BK) allocation withdrawn but Daily Hornchuch (RD) allocation introduced. Diverted via Oldchurch Hospital - Pentowan journeys withdrawn. Converted to Titan crew operation. 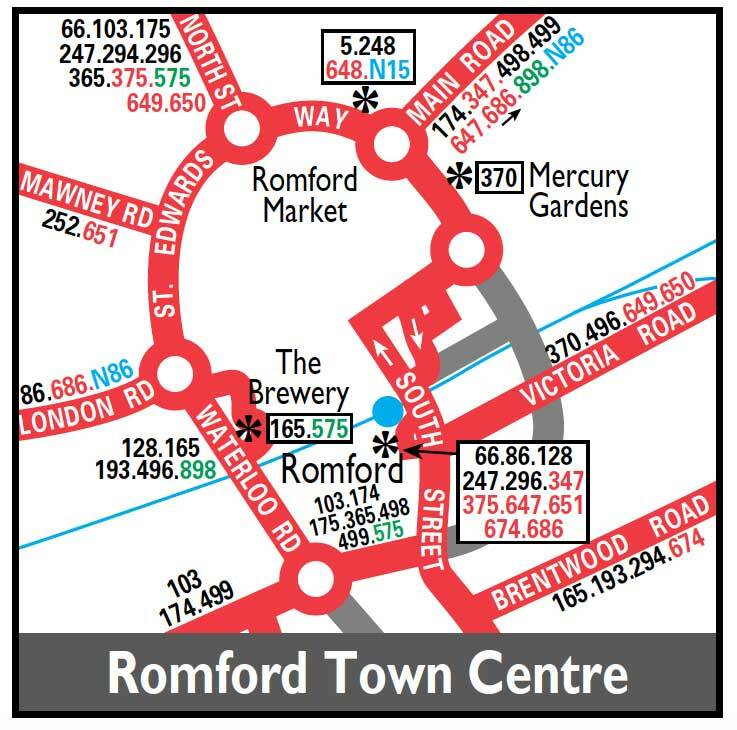 Re-routed northbound in Romford to serve Bus Station. SDO journeys diverted at Main Road via Balgores Lane - Gidea Park Station - Upper Brentwood Road - Main Road - then line of route. Commencement of three year contract. New contract commenced - route restuctured to terminate at Harold Hill thus withdrawn to Tees Drive - replacing withdrawn Route 374.